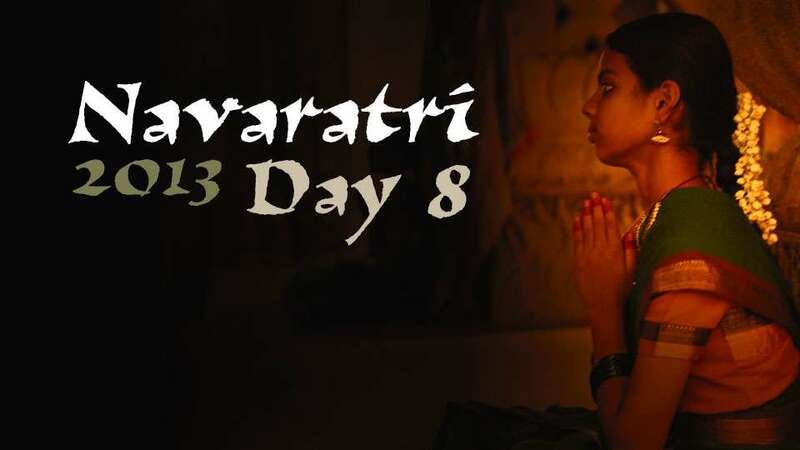 On the eight day of Navratri, Sadhguru looks at devotion and its significance, and we ask a few of the women who participated in the Navratri sadhana about their experience of the past eight days. are a time of great festivity in India. At the Isha Yoga Center, several colorful and exuberant events will be taking place throughout these nine days and on Vijayadashami, the day after Navratri. 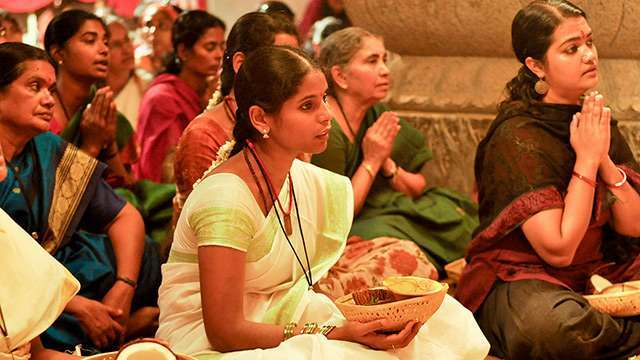 , Sadhguru looks at devotion and its significance, and we ask a few of the women who participated in the Navratri sadhana about their experience of the past eight days. Sadhguru speaks about the quality of devotion and its significance in one’s life. 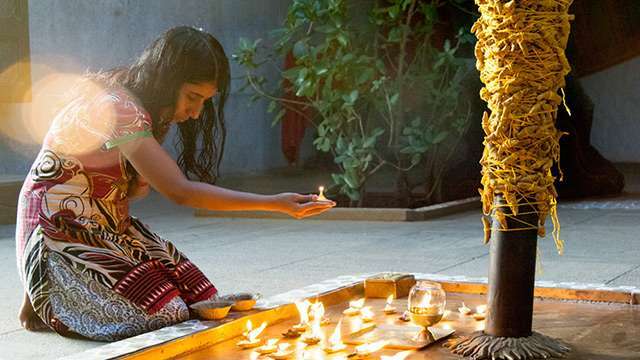 Sadhguru: The nature of devotion is largely feminine. You may be a man, but if you become a devotee you begin to feel like a woman in your emotion. Devotion is a crazy thing. Devotion is that which is devoid of you. It is not a love affair. Love itself is a crazy thing but there are shreds of sanity attached to it; you can still recover. In devotion, there is no shred of sanity. Devotion does not allow recovery. When I say devotion, I am not talking about belief systems. Belief is just like morality. People who believe some nonsense think they are superior to others. The moment you believe something, you don’t get any better. It is just that your stupidity gets confident. Confidence and stupidity are a very dangerous combination. Intelligence and hesitation are natural. The more intelligent you are, the more hesitant you become in many ways because if you start looking at all the dimensions around you, you clearly understand that what you know is so miniscule, there is no way to act in confidence. A belief system takes away this problem. It gives you enormous confidence but it does not cure your stupidity. Devotion is not about belief, it is about moving into trust. So the question arises, “How can I trust?” The fact that you are sitting comfortably, that is trust. Because you know, there have been incidents where the earth has opened up and swallowed people. There have been incidents where pieces of sky have fallen on people and crushed them to death. There have been situations where the very air that people breathed turned against them. This round planet is spinning and traveling at a tremendous speed and the whole damn solar system and galaxy are traveling at we don’t know what speed. Suppose Mother Earth decides to suddenly start spinning in the opposite direction, maybe you will fly off from where you are sitting right now – you don’t know. So, for you to sit, smile, listen and talk to someone, you need trust – enormous trust, isn't it? But you are doing it unconsciously and un-lovingly. Just learn to do this trust consciously and lovingly. That is devotion. Once you learn to sit here, consciously and lovingly trusting the existence the way it is, that is devotion. Devotion is not a belief system. Devotion is the sweetest way to be in the existence. Hands of Grace, the handicrafts exposition has begun at the Isha Yoga Center, and will run till 13th October. Today, we feature Warli art. Warli is a traditional form of wall painting practiced by the Warli tribe, who decorate the walls of their houses with this distinctive artform. This style has been compared to the cave art found in the Bhimbetka rock shelters of Madhya Pradesh, which date as far back as 10,000 BCE. Figures in warli paintings are predominantely depicted using the basic geometric shapes of the square, circle and triangle. The themes depicted usually revolve around the relationship between nature and Warli culture, relationships within and among tribes, family life, dance forms, and people’s relationship with deities and cosmic forces. They serve as a medium of communication and help maintain cultural and social solidarity. 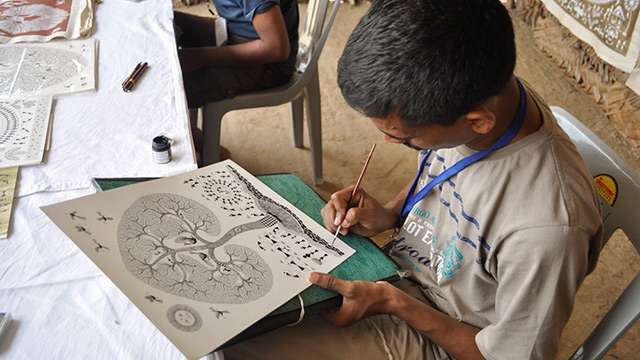 Since the 1970s, Warli art has been receiving its share of attention within India and abroad. Warli art has adapted and evolved to meet the requirements of this new dimension. The canvas has expanded from house walls to paper and cloth, and brushes have replaced traditionally used bamboo twigs. Rice paste has made way for oil paints, and more colors such as blue, black and purple are being used. 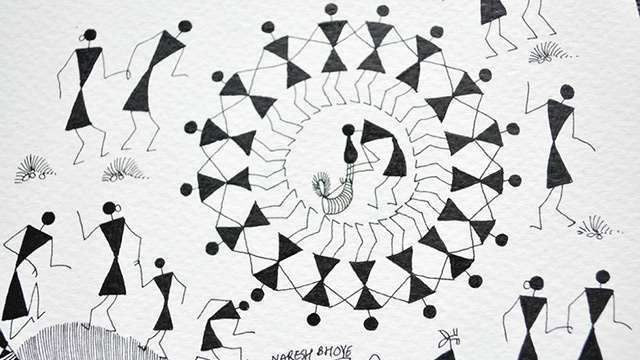 Warli art has become a part of mainstream social awareness these days and in 2010, Coca-Cola featured Diwali in their “Come home on Diwali” ad campaign. Shreya Devnath, disciple of violin maestro late Padmabhushan Shri Lalgudi Jayaraman, is known for the liveliness and maturity of her renditions. Her understanding of the nuances of harmony and her ability to rise to the occasion have been noted by critics, who have appreciated many of her exciting performances. Her creative explorations of ragas, and the clear traces of the Lalgudi bani in her music have also drawn praise. 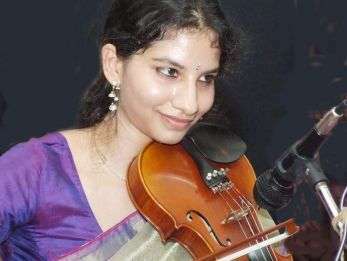 Her debut at Sri Krishna Sabha in 2007 was declared the best junior concert of the season, and since then she has won several prizes and awards. She will be accompanied today by Shri NC Bharadwaj on the mridangam and Shri Manigandan on the ganjeera. Playing on the occasion of Navratri, Shreya Devnath very appropriately chose to play only songs on Devi during her concert. She commenced her performance with Kanchadalayadakshi Kamakshi in raga kamalamanohari set to adi tala. Next was Janani Ninuvina set to raga ritigowla in talamisra chapu. She was accompanied by NC Bharadwaj on the mridangam and Manigandan on the ganjeera. Next was Pahimam Shri Rajarajeshwari in janaranjani raga set to adi tala. On the fourth day of Navratri, Sadhguru looks at the quality of Rajas, and participants share their experience of the daily Dandiya Raas. At the close of the 2016 Hatha Yoga Teacher Training, the new teachers share their stories of transformation.